The “Purple States” project aims to merge the best of citizen journalism and the established media. Described as “reality news” and a cross between “The Real World” and “The Huffington Post,” it launched in the run up to the 2008 elections. The “Purple States” project previously highlighted a handful of media makers that spanned geographic and demographic lines, each of whom sounded off on politics and the issues of the day. Now, the size and scope is even more ambitious. Ten days ago, “50/50” was launched, highlighting a blogger in every U.S. state. Each providing a truly local insight into current events. Yours truly was enlisted to represent the Aloha State. 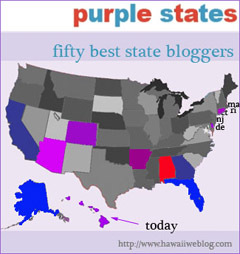 My video hit the “Purple States” home page today (and will be archived here). The project’s team distilled nearly fifteen minutes of footage (plus assorted “B roll”) for each participant, which was surely no small task when dealing with someone as verbose as I. In addition to the state-by-state profiles, there will be periodic theme videos compiling comments on a specific topic. But what “Purple States” really wants to see is the start of a rich conversation about what everyday people are doing and thinking. The “Purple States” site has an ongoing, largely thoughtful discussion thread touching on everything from Wal-Mart to Ted Stevens, from the enviroment to the automotive industry. Congrats Ryan, I bet you’re stoked. Well done, Ryan. I watched your video and it was great. Congratulations.